Here we go! Saturday Night Movie Sleepovers is working double time in October, delivering one horror film a week in celebration of Halloween! To start this insane marathon off the boys have picked a fan request, a remake of a classic property that scared SNMS‘s own Dion Baia so bad when he first saw it in the cinema that it scarred him for life. So along with his partner-in-crime J. Blake, they’re gonna have a massive therapy session to exorcise all those 35mm demons forever. 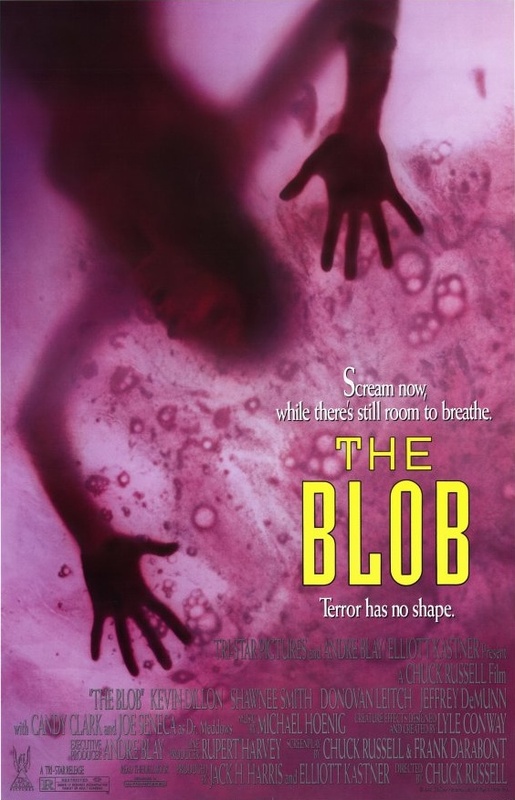 The boys are all in this week as they examine Chuck Russell‘s film The Blob, from 1988. They compare and contrast this from the 1958 original, analysing the updated themes (and SFX for that matter), seeing if this scary mass of crimson ooze is scarier and even craftier than it’s predecessor. Does this 1980’s film hold up to the more cynical and critical standards of today? How does this stack up against the other 1980’s creature-features that dealt with the same kind of ideas, i.e. foreign invaders wreaking havoc on helpless, isolated victims? Will doing 1 podcast a week for the month of October to celebrate Halloween burn Blake and Dion out? What other surprises lay ahead within a month of terrifying, unbridled horror? Hell, will they instead over stay their welcome? Well come check out another exciting, hilarious and informative episode of Saturday Night Movie Sleepovers to find out! Check out the surprising graphic trailer for the 1988 film! Here’s the 1988 Cinefantastique article on The Blob, a retrospective of it and the original cult classic film. Take a listen to the complete Soundtrack! Have a look at the little known, an even lesser seen trailer for the 1972 sequel to the original 1958 film, entired The Blob 2: Son of the Blob aka Beware! The Blob!, directed by none other than Dallas‘ own Larry Hagman! !